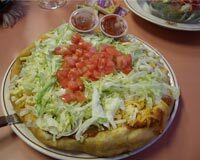 Take a bowl and mix ingredients to make fry bread. Knead the dough lightly, cover and keep aside for about 15 minutes. Heat one inch vegetable oil in a 10 inches skillet. Pinch off dough in small amounts and pat the dough into thin 8 inches circles. Fry them in the hot oil until brown on both sides. Now drain on paper towels. To make filling heat oil and fry ground beef and onion until brown, drain. Add beans and garlic salt with it. Simmer for about 10 to15 minutes. To serve, spoon filling onto the fry bread. Top with grated cheeses, lettuce, onion and salsa.